We’ve been developing the best drivers on the UK’s roads since the ‘60s, and in 2013 we opened our very own driving school to the public. We’ll take you from a class B driver’s licence to hitting the road behind the wheel of an Eddie Stobart LGV. With comprehensive courses run by a team of fully qualified trainers, dedicated training space and in-house testing, we’re your one-stop shop to becoming an LGV driver. We have two training centres located close to some of the UK’s main motorways in Warrington and Rugby. Both locations boast dedicated, fit-for-purpose training facilities. Sorry, no results were found for that search. Please try again. Our drivers are among the best on Europe’s roads; they receive the highest quality training from our highly-qualified, dedicated trainers. And now this service is available to you! Our team will take you through every step of your journey onto the road. Train in our famous trucks, specially fitted for driver training, and in our for-purpose training facilities. Then take your exams on-site with our in-house examiner and get behind the wheel as Eddie Stobart’s newest driver: successful completion guarantees a job! Following the application and interview process our team of licensed trainers will be with you every step of the way; from day one behind the wheel in our specially-commissioned training vehicles, right up to the day of your test. Candidates study theory, hazard perception and case studies before getting behind the wheel in one of our trucks. Practical training takes place on pre-approved routes local to the schools and manoeuvres on our 28,000 square feet private yards, away from distractions and hazards. Candidates receive approximately 20 hours experience behind the wheel and 20 hours observation in-cab. We even have our own DVSA-delegated examiner who’ll carry out your tests on site, so there’ll be no surprises and no delays. Glen Moule has been in the haulage industry for over 30 years, 20 years of them as a driver trainer and examiner. He was with the Driving Standards Agency for over 10 years performing driving tests on cars, bikes, trucks and buses. Complete the short form below and book your place today. In order to apply for training with us, you must be 18+ years old, have held a Category B licence for more than two years and applied for your LGV licence. We’re confident that you’ll pass first time and we can’t wait for you to become part of the Eddie Stobart family. Finance available on all our courses, take a look at our finance calculator and customise your contribution. 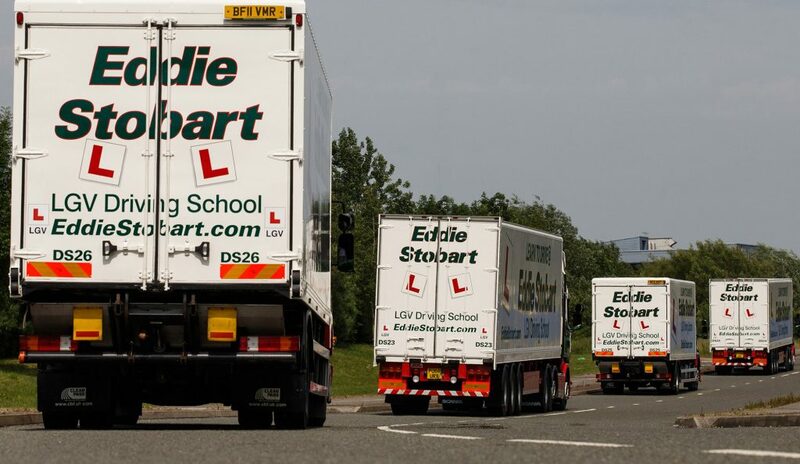 Find out what past candidates think of the Eddie Stobart driving school. We’re extremely proud of the hard work that goes into making our driving school a first-class training facility. We believe we provide our candidates with the best driving tuition and personal support available, and with a guarantee of employment upon completion, all successful candidates now drive our trucks. Below is genuine feedback from past candidates.